Oligoribonucleotides (AONs) vary in length between 16 and 22 nucleotides and are chemically modified to be resistant to intracellular nucleases. They are suggested to bind to specific sequences in the pre-mRNA, and thus disturb exon inclusion signals like splice sites, intronic branch point sequences, or exonic splicing enhancer elements. This leads to the removal of the targeted exon (Figure 1). 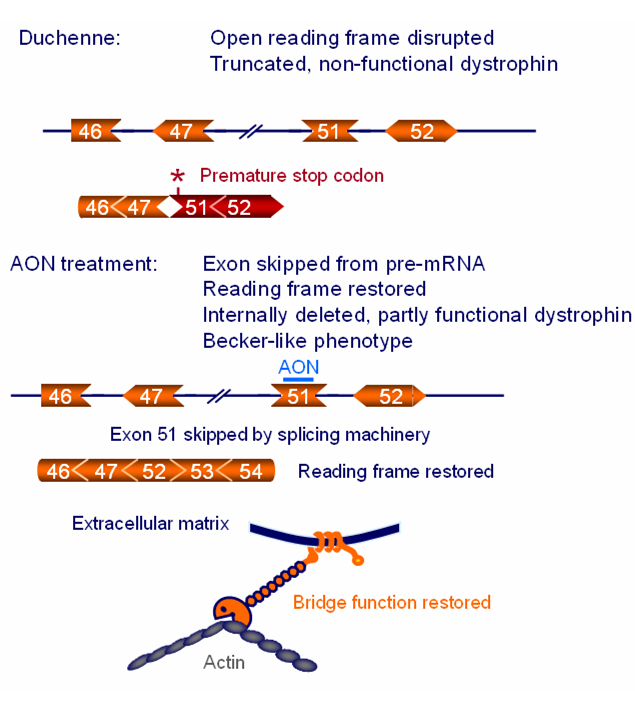 The generally applied procedure for the analysis of therapeutic exon skipping in cultured muscle cells is as followed. 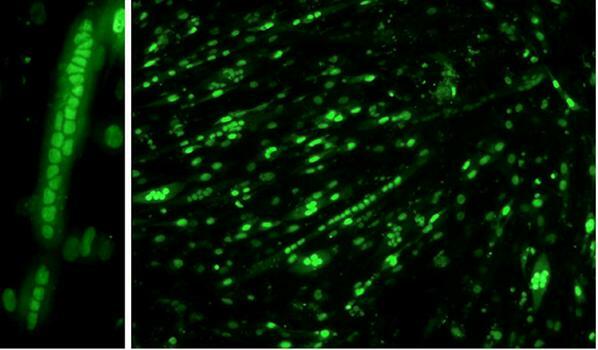 Muscle cells derived from DMD patients are proliferated in culture and allowed to differentiate into multinucleated myotubes through serum-deprivation. These myotube cultures are transfected with a sequence-specific, exon-internal AON with which the skipping of a specific exon can be induced. Previous years we used the cationic polymer polyethylenimine (PEI) for transfectiom, now use Lipofectamin. Lipofectamin is very efficient in delivering AONs into myotubes: up to 95% transfection efficiencies (Figure 2). After 24 to 72 hours, RNA is isolated from the treated cultures and analysed by RT-PCR (Figure 3). Correct exon skipping in the smaller transcript fragment is confirmed by sequencing. Immunohistochemical analyses with different dystrophin antibodies is performed to detect dystrophin expression at the membrane. In addition, total protein samples are isolated to detect dystrophin by western blot analysis (Figure 4).